The 2017 North American International Auto Show in Detroit is the first major auto show of the new year. The Motor City hosts one of the best shows for muscle car lovers and this year’s event was no exception. The Big Three were well represented and there were a few surprises that caught our attention as well. The temperature outside may have been in the teens but our enthusiasm heated up once we got inside Cobo Hall. There was so much to see and experience during the two-day media preview. Here are some of the great muscle cars we got to see at this year’s show. Chevrolet displayed two of the hottest Camaros in their lineup. First up is the ZL1. This fire engine red coupe is the most powerful Camaro Chevrolet has ever produced. With 650 horsepower and 650 foot-pounds of torque, this beast can sprint from 0 to 60 in 3.5 seconds. Chevrolet also brought out this 50th Anniversary Edition convertible. This Nightfall Gray beauty comes equipped with wheels, stripes, and interior treatments that are unique to the anniversary model. The 50th Anniversary Edition is available on the 2LT and 2SS models and is available now. Ford brought out two of the hottest Mustangs you can get your hands on. This Shelby GT350 is one of the fiercest Mustangs to come out in years. It’s quite intimidating just sitting still on the show floor. Ford also showed off this 2017 Roush P-51 Mustang. Jack Roush, founder of Roush Performance, has a love for the World War II era P-51 Mustang fighter plane and this is his latest P-51 special edition. It sports a Roush Trakpak front splitter, custom P-51 badging, and side rocker winglets. Who says you can’t get a muscle truck anymore? Ram brought two special edition trucks that prove you can still get a performance truck from the factory. The Ram 1500 Night Edition includes a black grille, blacked-out badging, and 20-inch black wheels. It’s available with a Hemi V8 with 395 horsepower and 410 foot-pounds of torque. Ram also showed off this Black Express. It’s aptly named because every inch of this truck is covered in black. It too is available with a Hemi V8 with 395 horsepower and 410 foot-pounds of torque. Both are available now from your local Ram dealer. Over at the Chevrolet booth, we found this striking 2017 Chevrolet Corvette Grand Sport. With 460 horsepower, it’s no wonder this latest edition of the Grand Sport can go from 0 to 60 in 3.6 seconds. The Grand Sport features wider fenders that house wider wheels and tires and also comes with a distinctive mesh grille and front fender inserts for increased airflow. And with five driving modes available, this Grand Sport is at home on city streets as well as the local track. Ford proves that good things do come in small packages. This Orange Spice Fiesta ST is powered by a 197 horsepower EcoBoost 4-cylinder engine. This entry-level ST model also comes standard with a mesh grille, high-mount rear spoiler, and twin chrome exhaust tips. Ford also displayed this Focus ST decked out in a bright, stealthy black paint job. It’s also powered by an EcoBoost 4-cylinder and comes standard with a 6-speed manual transmission and sport suspension. The real deal is this Stealth Gray Focus RS. With 350 horsepower and all-wheel drive, this pint-sized hatchback can keep up with the big boys. It’s definitely a star in Ford’s performance lineup. The Hellcats were running loose over at the Dodge booth. These Redline Red bad boys are two of the most powerful cars you can buy today. And with 707 horsepower, they’ll be hard to keep up with. The Hellcats always draw a crowd at the auto show and we enjoyed getting to see these two while we were there. A few independent auto makers showed off their cars at Cobo Hall this year. VLF is an American luxury sports car manufacturer started by former General Motors Vice Chairman Bob Lutz, entrepreneur Gilbert Villarreal, and automotive designer Henrik Fisker. The VLF Rocket V8 is a Mustang on steroids. Designed by Fisker, this 725 horsepower beast features a hexagonal carbon-fiber grille, front splitter, and comes as a coupe or speedster. The Force 1 V10 is a carbon-fibered, two-seater that’s a beauty on the outside and a beast underneath the hood. The Force 1 V10 also features 21-inch wheels, high performance Pirelli tires, and a unique rear wing spoiler. The Destino V8 sedan is powered by a Corvette LS9 V8 pumping out 638 horsepower. It features an aluminum body and aluminum space frame. It can go from 0 to 60 in 3.9 seconds and has a top speed of 200 mph. Another independent we discovered was this Falcon Motor Sports F7 Series I. Under the hood is a Lingenfelter-built twin turbo V8 rated at 1,100 horsepower. It’s built in Detroit using lightweight carbon fiber/kevlar body panels and only weighs 2,785 pounds. With a price tag around $225,000, this is probably the only one we will see for some time. There were a few “sleepers” at the show that don’t seem to get a lot of attention but were definitely worth checking out. The Ford Taurus SHO is one of the few muscular full-size sedans still on the streets. This EcoBoost powered cruiser comes standard with all-wheel drive, sport-tuned suspension, and 20-inch aluminum wheels. The Buick Regal GS comes with a 259 horsepower 4-cylinder turbo engine and features sport mode selectivity, Brembo front brakes, and dual-outlet stainless steel exhaust. The Jeep Grand Cherokee is quite a powerhouse with its 475 horsepower Hemi V8. It also has performance equipment you’d expect to see in a car such as launch control, selectable driving modes, and Performance Pages Plus. There’s no better place to see the latest muscle cars than Detroit. 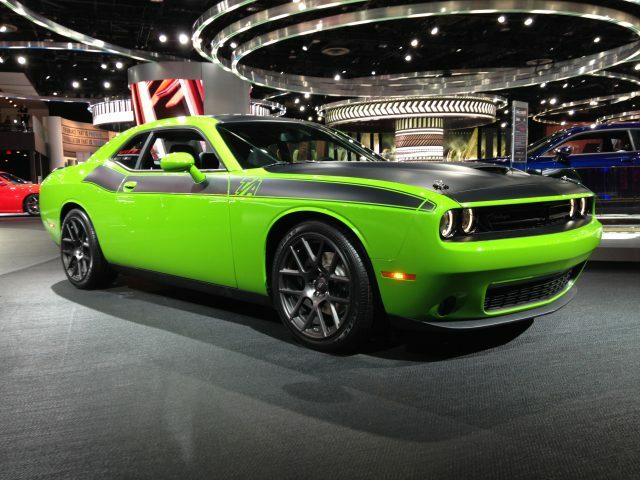 This year’s North American International Auto Show displayed some of the coolest muscle cars to come out in recent years. They don’t call Detroit the Motor City for nothing and it’s a great place to see all the greatest muscle cars in one place. We’re already looking forward to next year’s show!